Tense, nail-biting action adventure type film with a stupid nonsensical plot and poorly thought out characters but enough explosions and overall craziness to balance things out in its favor. 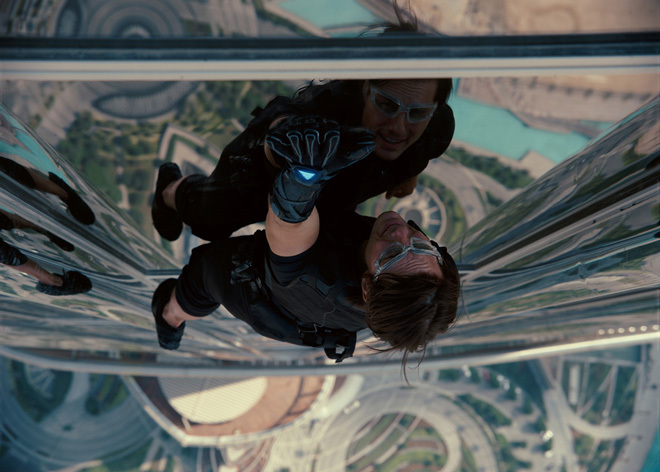 And Tom Cruise scales, then jumps off and runs down one of the largest buildings in the world here. If that isn’t the very definition of crazy, I don’t know what is. As I mentioned before, the plot doesn’t make a whole lot of sense. The bad guy here is some nutjob who wants to start a nuclear apocalypse to purify the human race, or something. His motives are ridiculous, and the one scene where he explains to a UN looking crowd, and, in turn, us, exactly why he’s doing what he’s doing makes absolutely no sense at all. And why would anyone in their right mind want to help this guy out anyway? He’s advocating for the almost certain annihilation of the human race; why does he have so many people helping him? How? Huh? Whatever. The action pieces also don’t make any sense. The “famous” one of Cruise scaling the giant building is cool, and had me at the edge of my seat, sweating, thinking I was going to have a heart attack, but it’s ultimately silly and seems like the kind of thing that could have easily been done by, I don’t know, climbing a staircase and kicking down a door? Granted it wouldn’t have looked as cool, but still, let’s not resort to the craziest possible plan of action whenever we’re presented with a problem. You’re all super intelligent government spies, for crying out loud. Think things through at least. The film seems to throw logic out the window at every step, come to think of it. The whole Dubai scene, though tense as heck and probably the best in the film, didn’t make any sense at all. Their plan is to **SPOILERS** pretend to disguise themselves as both the female assassin and the guy trying to buy the nuclear launch codes from her so they can, what? Capture and interrogate them? Prevent the main evil bad guy from getting the launch codes? Why the need for the ruse at all, then? Why not just wait until they’re both safely in their respective rooms and capture them then and there? **END SPOILERS** It’s suspenseful, granted, but it doesn’t make a whole lot of sense. Overall, I enjoyed the film, despite its many, many stupid moments. The film is very entertaining and action packed, though the plot is simple, almost absurdly so. I kept wishing it would give the audience something to chew on intellectually; a little bit of a puzzle maybe, or a clever plot twist, or something beyond all the explosions and well shot action. But no. Even the ending felt cheap and relatively sudden given the work they all had to go through to get to that moment. It’s a cop-out, in many ways. But eh. It’s entertaining enough. The type of movie you enjoy in the moment but quickly forget about as soon as the credits start to roll.